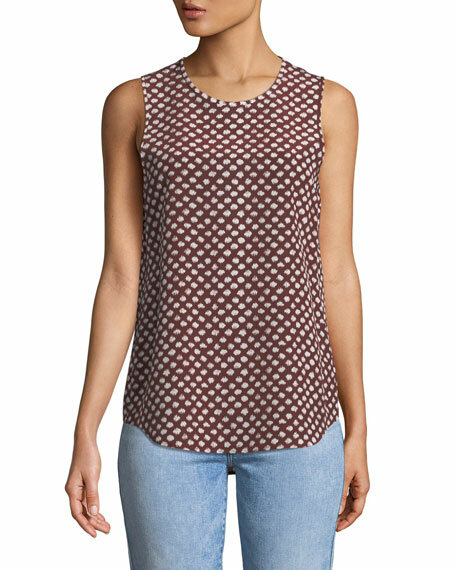 Theory "Bringham" top in dot-print. Smooth stretch jersey tank; available in your choice of color. Approx. 30"L from shoulder to hem (size XS measured). Scoop neckline. 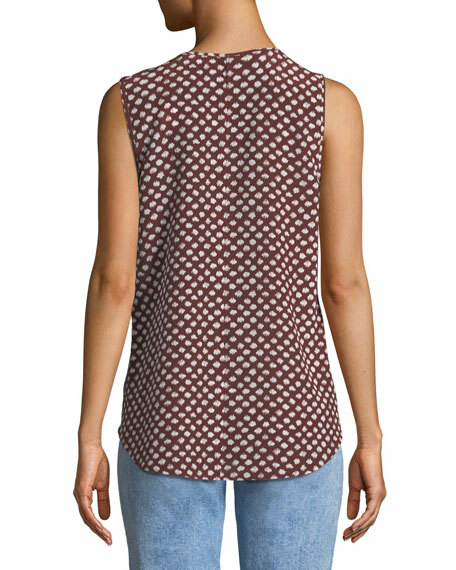 Sleeveless; full-shoulder coverage. Fitted silhouette layers smoothly. Silk; hand wash. Imported. Model's measurements: Height 5'10"/177cm, bust 32"/81cm, waist 25.5"/65cm, hips 33.5"/83cm, dress size US 2/4. Necklace not included. Fine ribbed knit in your choice of color. Approx. length: 16.5"L down center front, 22.5"L down center back. Scoop neckline. Fine ribbed knit in your choice of color. Approx. length: 16.5"L down center front, 22.5"L down center back. Scoop neckline. Sleeveless. Slim fit. Hem hits at hip. Pullover style. Cotton; hand wash or dry clean. Imported. Model's measurements: Height 5'10.5"/179cm, bust 33"/84cm, waist 24"/61cm, hips 34"/86cm. Joan Vass ultra-soft ribbed tank. Approx. length: 17"L from shoulder to hem, 22.5"L down center back. Scoop neckline. Sleeveless Slim fit. Pullover style. Cotton. Machine wash. Imported. Model's measurements: Height 5'10"/177cm, bust 33"/84cm, waist 25.6"/65.2cm, hips 35.8"/91cm, dress size US 2-4/FR 34-36.